he is the one on stage left. because you could be going around lucky all day and not even know it. happy st. pat’s day to all! As a rule I am against dressing dogs in Rodeo Drive sweaters, but hey, this was just for a moment and they look more than happy to pose. 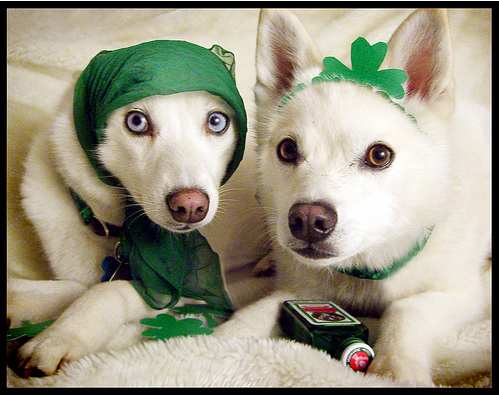 Ole Blue Eyes on the left looks as if he could tell a tale or two, while Ms Frou Frou with the shamrock in her hair has the look of a nightclub chanteuse. Enjoy the day! thanks for making the exception! Yikes where did that blue devil avatar come from? Fun Photo Beth. Happy St. Paddy’s Day! To you as well:) Beautiful picture. Happy St. Paddy’s Day. Love the dog photo. This really made me chuckle. Happy St. Paddy’s to all of you! And you! I will not wish you the luck of the Irish, however, as all Irish luck stinks! I adore the photo. Happy St. Patrick’s Day to all. OMG, I should have known you are Irish. Beautiful.